In this healthy dessert, the flavor of the antioxidant-rich blueberries is complemented by sweet peaches and creamy buttermilk. Both of these fruits are in season, so now is a great time to bake this cobbler. 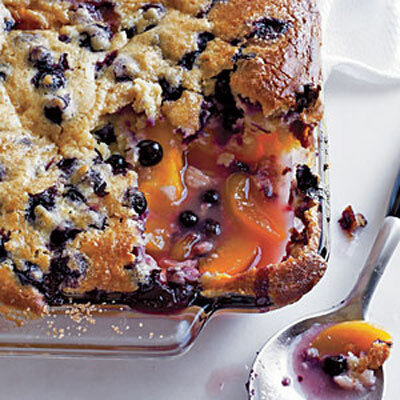 Stir the blueberries into the batter, which you'll layer on top of the peaches, and bake until bubbly and crispy. Yum! A couple of tips: Try to find peaches that aren't too ripe--they'll hold their shape much better in the oven. It's also a good idea to place a sheet of foil under the baking tin. This saves clean-up time if the cobbler overflows.